I got this book – Brockenbrough’s first – as an ARC at BookExpo America. To be honest, I don’t usually expect much from BEA ARCs, especially from first-time writers. All too often I feel like they’re chasing a trend and don’t stand on their own that well. 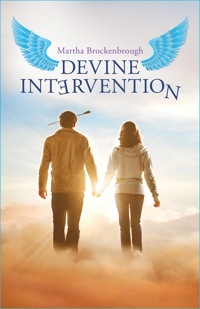 So when I say Devine Intervention blew me away, that’s saying something. Mostly that’s due to the strength of the characters and their voices, especially Jerome’s. I know Jerome. Everyone knows a Jerome. He’s not a bad kid, he just can’t seem to stop himself from listening to the wrong people and making the wrong choices, and enough people have given up on him that he’s given up on himself. As familiar as Jerome’s type feels, though, he doesn’t read like an archetype – he’s very much his own character. Heidi is a bit more standard – the awkward, insecure teenage girl is pretty much a staple of YA – but she still comes across as very likable, even if she doesn’t quite break your heart the way Jerome does. The actual prose is fantastic, too. The book is laughing-out-loud-on-the-subway-and-getting-weird-looks-for it funny, whether it’s Jerome’s voice, Heidi’s, or the list of Commandments for the Dead that are interspersed throughout. And then in the best way possible it brings that humor screeching to a halt in order to put your heart through the wringer. I burst into tears at least twice while reading it (thankfully not on the subway). Honestly, there’s not much else to say. It’s a remarkable first novel and a really enjoyable read. My one quibble is the fact that Jerome, who has watched over Heidi since infancy, is attracted to Heidi, which kind of squicks me out, but even that is downplayed – the book certainly isn’t a romance. All in all, Devine Intervention gets four and half cupcakes, and I look forward to reading Brockenbrough’s next. This entry was posted on Wednesday, September 12th, 2012 at 6:22 pm and is filed under 4.5 Cupcakes, Contemporary/Urban Fantasy, Fairy Tale/Mythic, Humor. You can follow any responses to this entry through the RSS 2.0 feed. You can leave a response, or trackback from your own site.